The art of the perfect hash adventure at a restaurant or in your own kitchen. Whoa! I mean, WHOA! 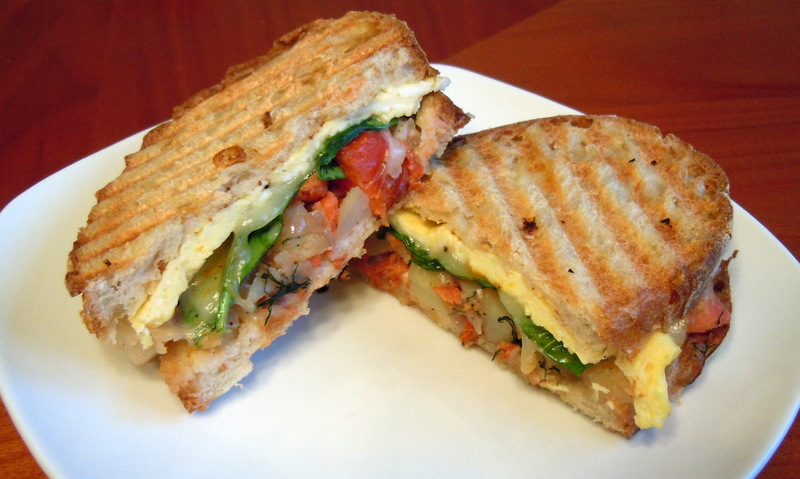 Who knew hash and panini were soul mates, like yin and yang or peanut butter and chocolate? The answer is several innovative food carts and foodies across the US. My @Hashcapades twitter feed is an endless source of ideas and entertainment. It was there I discovered versions of hash in sandwiches. I thought, “Well, how about in a panini?” And the rest, as they say, is history! 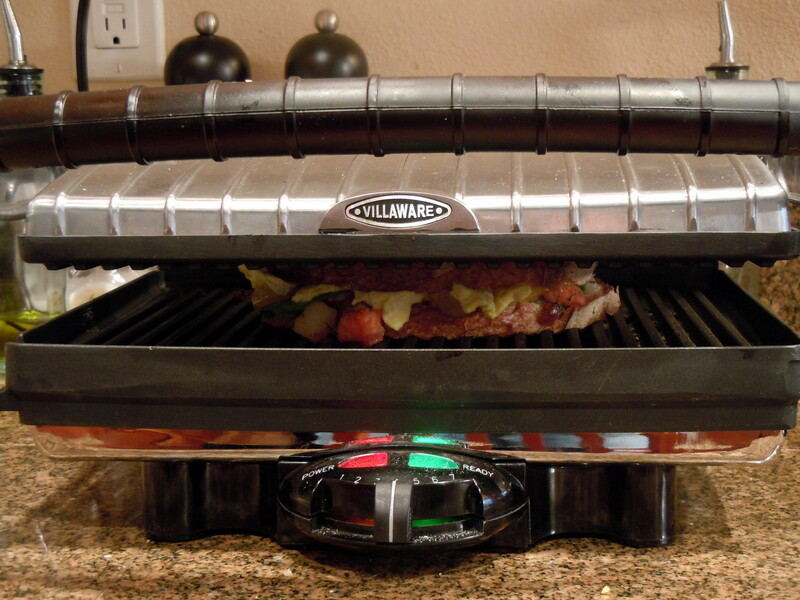 My panini grill, getting it done! So, which hash recipe deserves the panini treatment? 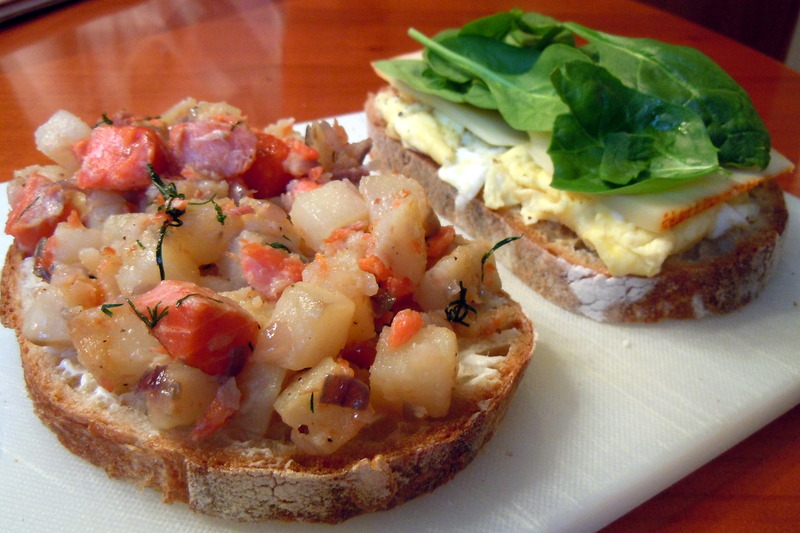 No contest – my award-winning Smoked Salmon Hash – huzzah! On New Year’s Day, I recreated this recipe, but neglected to pick up a sweet potato, but the Russet potatoes worked well. The following morning, I started building the panino, one step at a time, starting with good quality Como bread from Grand Central Bakery. 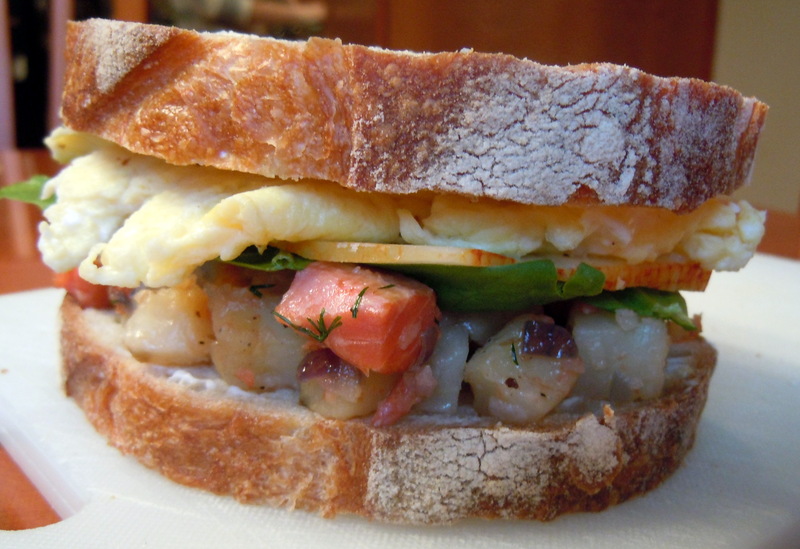 Good bread is key to a fab panino. Mayo on one side, country Dijon on the other. 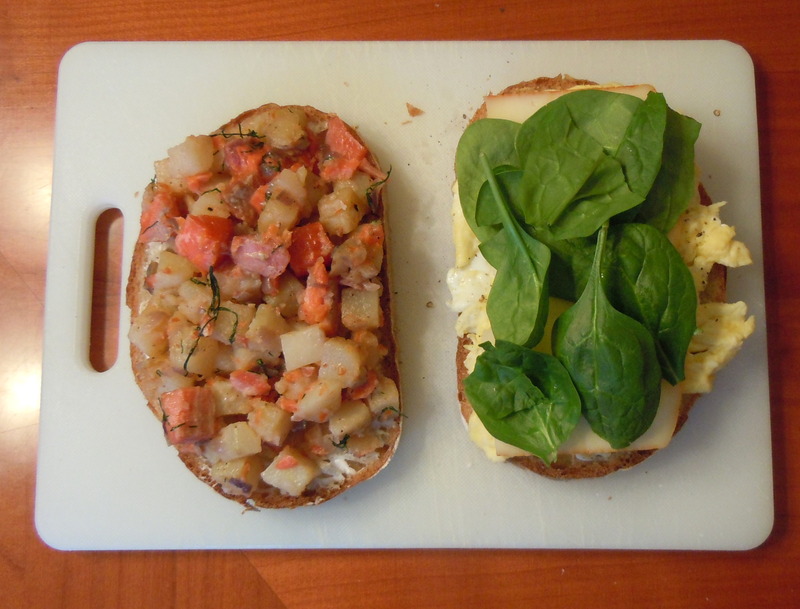 Cover one side with Smoked Salmon Hash. At this point, I wondered how I wanted the egg to be prepared. Given the fact that it was a pressed sandwich, oozing yolk on my grill was not an option, not to mention I think it’s illegal in five states! Scrambled eggs would have to do in a pinch. 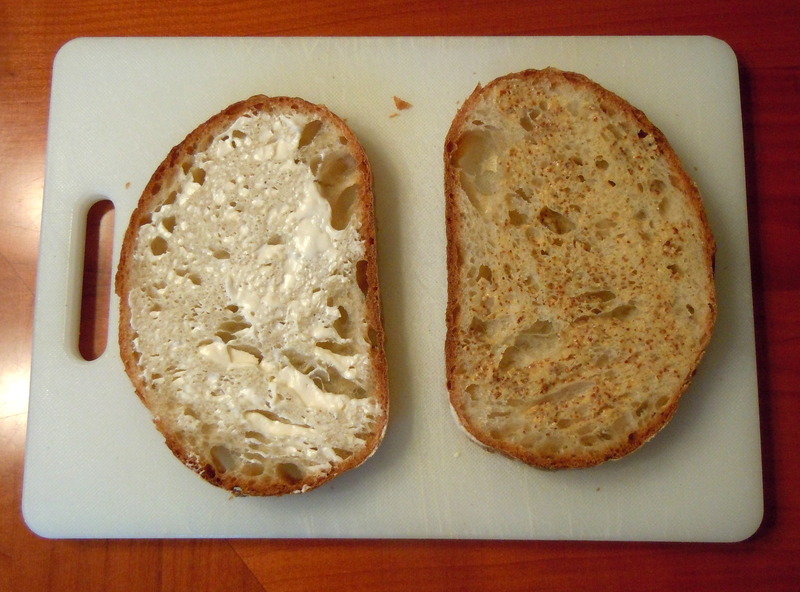 My next challenge was the cheese…something piquant like chipotle smoked gouda or a nice Muenster? 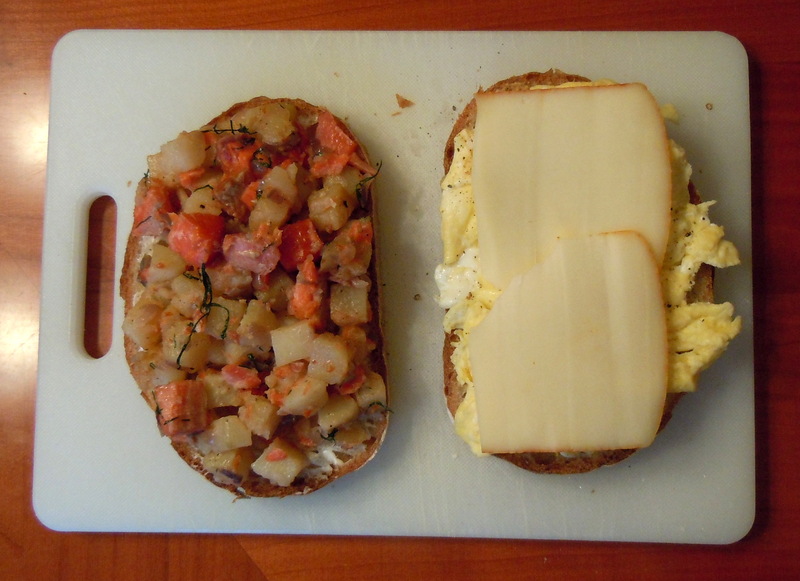 I chose Muenster because I didn’t want the spicy cheese to over-power the hash, plus, Muenster melts nicely. Slap on a couple of slices of Muenster. Add a little spinach for color and flavor. Okay, now flip the top over and marvel at your culinary masterpiece. Then, simply put it in the panini grill for about 5 minutes or until the bread is striped with golden brown lines of perfection. Be careful not to stare at the lines as this may cause vertigo! 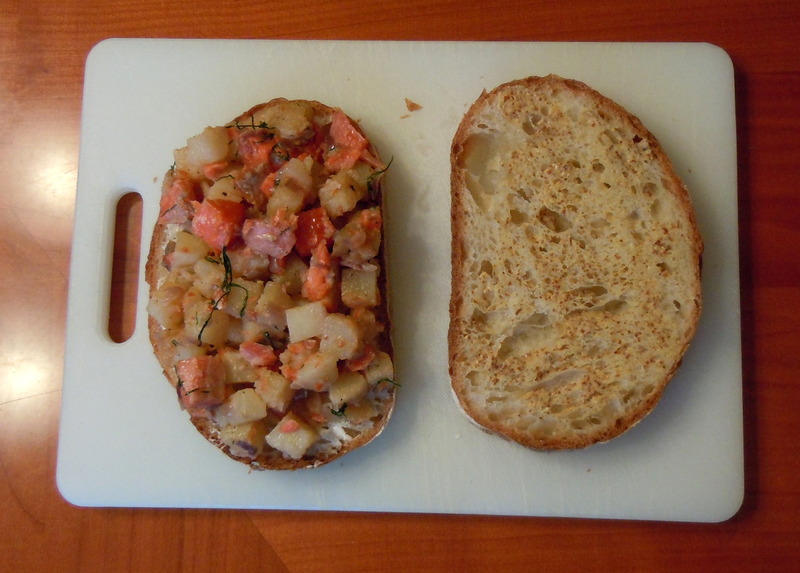 I eagerly cut the panini in half and couldn’t wait to sink my teeth into my first hash sandwich. My son, Alex, had the other half and quickly gave it a thumbs up. My first bite of crunchy goodness coupled with the softer hash, cheese and egg filling was simply ridiculously good. Molto bene! So, tell me about your hash adventures. Ever make something unique with leftover hash? What about hash empanadas? Let me know!